Scrub Notes: A Blog For Med Students: Can A Machine Replace An Anesthesiologist? Can A Machine Replace An Anesthesiologist? TOLEDO — The new machine that could one day replace anesthesiologists sat quietly next to a hospital gurney occupied by Nancy Youssef-Ringle. She was nervous. In a few minutes, a machine — not a doctor — would sedate the 59-year-old for a colon cancer screening called a colonoscopy. 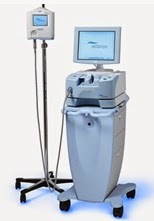 The Johnson & Johnson device won approval from the US Food and Drug Administration in 2013, but so far only four hospitals are actively using the machine. Of course, anesthesiologists are opposed to the machine, as it threatens their livelihood. So far, they have succeeded in having the machine limited to very restricted indications, mostly simple screening procedures. The benefit of using the machine over referring physicians self-administering sedatives is that the machine can administer more powerful drugs like propofol, and more closely monitors vital signs. What this means for anesthesiologists of the future is unclear. Will the machine stay limited to such narrow indications? Or will it gradually increase its scope, eventually displacing anesthesiologists in all but the most complex of cases? In some ways, the situation is even more dire for nurse anesthetists, as one can more easily imagine replacing them with such a machine. The question of liability is left open in the article, but I imagine most referring physicians and hospital administrators would take on the increased risk if the machine proves to improve patient volume sufficiently without sacrificing safety. What about medical students deciding on a specialty? It is always hard to forecast the future and one certainly shouldn't make career decisions simply off of potential risks. Each specialty faces the threat of technological disruption (just ask cardiothoracic surgeons who trained before the advent of coronary cath). The world described by physicians past in books such as The House of God no longer exists, much like the world we now inhabit described in Intern will be considered antiquated in decades hence. What is a medical student considering anesthesia to do? Each person has to answer this question for themselves. However, if you are passionate about a specialty such as anesthesia, the answer is simple: pursue it. Do not let fears of future change dissuade you from the field where you believe you can be your best. Instead of avoiding the risk, embrace it by keeping abreast of the changes in the field, staying ahead of them, and perhaps even being the game-changer within the specialty. Over time, all medical fields evolve. Make sure you choose a field where you will be excited to change to meet the future.